MNC 2018 is in the books! Congratulations to all who attended. Here are some links and a full report by the crew of "Muttley" follows. 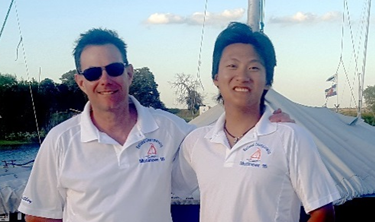 This was the hardest and most eventful 4 days I can remember, physically demanding and highly competitive which reminded me of sailing in my youth – except I hurt more these days. 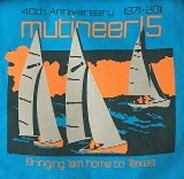 “Muttley” is a 1983 Wellcraft Mutineer with pedigree. In her last campaign she came 2nd to the “Blue Heeler” in the 2014 Mutineer Nationals. 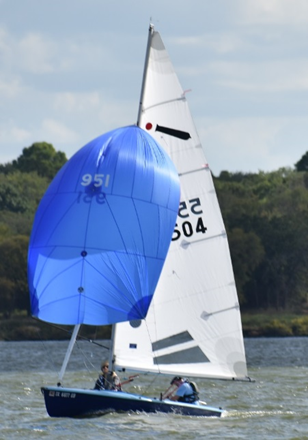 I bought her at the end of the 2016 season after attending a guest skipper day with the hope of getting our 8 year old son interested in sailing. I had not raced regularly or competitively since racing Optimists in Zimbabwe and England in my youth, crewing for my dad in GP 14’s and a season racing Lasers. The 2018 Nationals were coming back to Texas and I was keen to start preparations. My crew, Shaun and I developed as a team during the 2017 and 2018 seasons. Shaun was engaged to marry and his wedding day fell the same week as the MNC. Although I was disappointed, we enjoyed fine-tuning various boat modifications and tweaking procedures for his replacement. Greg Reed introduced me to Dustin, a recent college graduate who had just started his first full time job and new to Sailing. Although Dustin obviously lacked experience, his enthusiasm was infectious and we started training together. 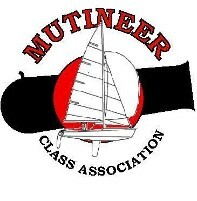 We did well in the GSC Mutineer Fall 4 week series. 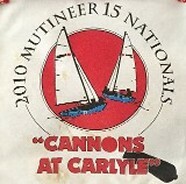 We knew the competition coming from out of state was going to be extremely tough including one of the Mutineer racing legends, Gib Charles with “Blue Heeler”. We did however have the home advantage. The beauty of one design racing is the hull and setups are similar and simple, the only exception is the interior and controls which have been substantially improved in the newer Nichols boats (produced since 2008). We had listed all the problems we had experienced in the fall series and their mitigations. This included having some basic tools, clips, shackles, rope and tape on-board with us at all times. 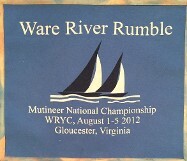 “Muttley” weighed in at 465lbs, above the minimum requirement of 410lbs and average across all the boats. Looking over the other boat generations from 1970’s through 2000’s was remarkable. We learned a few tips and tricks from the other competitors, one of which I integrated on “Muttley” thanks to Matt Dalton and “Super Chicken”. 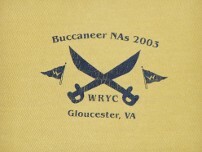 My crew adapted to the new spinnaker pole location on the mast very quickly. 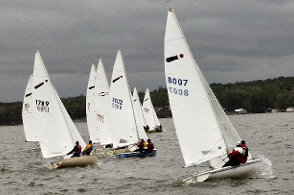 There were practice races in the afternoon in very blusterous conditions: gusting 18 to 23 knots. 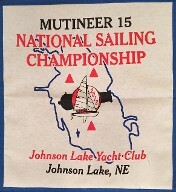 I raced the first with Randy McMillan from “Osprey” as both our crews were unavailable. “Muttley” performed well and it provided us some useful insight to our competitors. 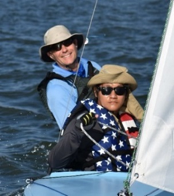 I made one notable error when I tacked late, lee side, to the fast approaching “Mutant” on starboard sailed by a Scottish couple (aka the Scots) as we headed towards the upwind mark. They had to take avoiding action –my mistake. This set the scene for many more close encounters with what became our closest rivals in the races to come. On arrival, I was welcomed at my boat by the Scots keen to show me 2 brightly colored Red “PORT” stickers they had placed neatly on BOTH sides of my cockpit. This competition was going to fun! On the way out, within 20 minutes of the first start, we realized the spinnaker was rigged incorrectly and we scrambled to fix it -fly it-dowse it -just before the start. We were now ready. We had some great racing, neck and neck with “Mutant”, “Kraken”, “Blue Heeler”, “Super Chicken” and “Disaster Recovery”. We had a scary moment as we approached the upwind buoy in gusty conditions. With the “Mutant” right behind us, my crews toe strap separated and he fell back into the lake. “What’s wrong with this picture” I asked myself as I reached behind his life vest and hauled him back into the boat. We continued. The Scots cheered –noting that their description of the event was me throwing my crew out in front of them! Dustin was winded but it could have been much worse. Then the moment of insane confusion as the Scots put it - an embarrassing penalty at the downwind gate. Having chosen the left-hand buoy to round, and with the muddle of unfurling the jib, dowsing our spinnaker and lowering the centerboard with several boats around us, I had inadvertently drifted to the right-hand buoy and called “water” on the Scots. A reply came back that I simply did not understand until I saw both gate buoys on my port side and realized what I’d done. Several boats had got through, a few colorful words were said as we both reversed ourselves. I had totally missed the downwind gate, took the Scots with me and this wasn’t team racing. I did my penalty turns -enough said. In a following upwind battle, the tiller extension separated from the rudder which impacted my ability to hike out. We finished the race and used tape to re-attach it. It separated again during the following race. 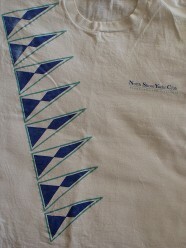 I re-attached it again with more tape during a downwind spinnaker run. I remember Gib Charles’s expression as he passed us “Is that duct tape in your hand”; “Running repairs” I replied. We arrived pre-dawn, quietly confident but cognizant we could lose this championship if we were not on our game. We were met by the rather out of breath crew from “Mutant” who had run up to “Muttley” jokingly looking for their hacksaw –or was it? We appreciated some well wishes from various quarters of the GSC community which was nice and increased the level of expectation and pressure. We could afford to be more conservative as long as we finished near our closest competitors – namely the Scots in “Mutant” and the Floridian in “Kraken”. However, we did not know how many races would be run that day or what the aggregate scores would be after them. A moment of fright came as we sailed out to the start line. A rivet had started to pull out from the bracket supporting one of the two boom mounted pulleys. The wind was increasing and it was getting progressively worse. It was too late to go back. We laced some rope and shackles between the 2 pulleys such that when the one let go, it would be caught by the other and not tangle with the lower cockpit mounted pulley system. The pulley broke away in the 2nd race and the second pulley caught it. The impact to my mainsheet adjustments was minimal. We thought we would be OK for the rest of the day. 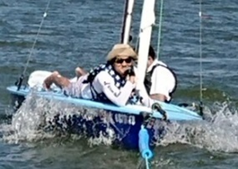 Just after the start of the 3rd race - the boom broke in half. I turned to my crew in disbelief “sorry buddy - gaffer tape is not going to fix this one”. There were a few hours of racing left. We drifted downwind. A safety boat came to our aid and pulled us upwind to a point we could sail back to the club on the jib. 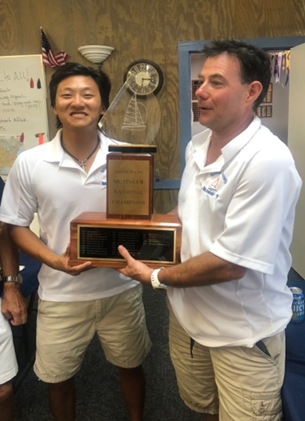 We were not about to give up, beached the boat, climbed a fence, borrowed a boom, re-rigged the boat and raced back out to the start line not knowing how many races we had missed - arriving just in time for the last race of the championship. I think we surprised a few folks by our return. We knew we had to be aggressive and finished 2nd after another hard fought tactical battle with “Mutant” who just pipped us to the finish line. We congratulated the Scots, not only for the race win but for what we believed was their championship. We thought we had missed 2 races. 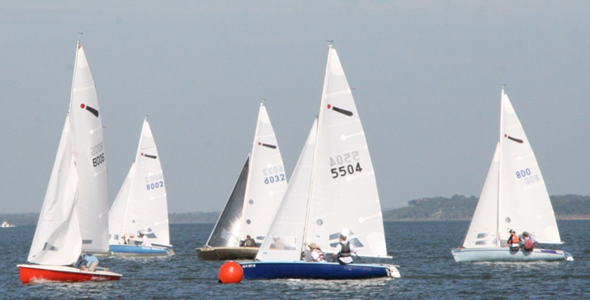 With the DNF due the boom break and a maximum of 2 throw outs prescribed in the Sailing Instructions, we were out of contention. We were exhausted and disappointed. We had put our all into the competition and it just didn’t work out – that’s racing. Fantastic racing. 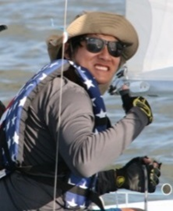 We had exceptional battles throughout, constantly trading places upwind/downwind with the many other boats during the competition. Flying the spinnaker was a challenging necessity to be up at the front. There had been multiple capsizing’s, close calls and rescues. It was later that we became aware that only 5 races had been run. We finished 3, so we had only missed 1. With that DNS and a DNF thrown, we realized we had done enough. Wow, what an emotional roller coaster. We could not believe it – it took a while to sink in. · Greg Reed: his leadership supporting MNC and keeping Fleet 2 together at GSC. · Volunteers who made the competition a monumental success. · Out of state participants who had travelled so far. 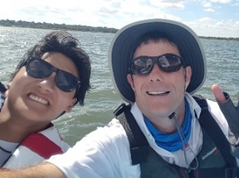 · My “Rookie” crew for his enthusiasm and perseverance. · My family for their loving support. 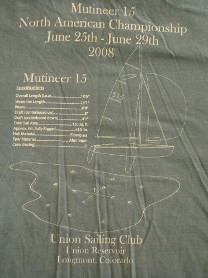 · Schurr sails who provided a jib after a last minute request. · The borrowed boom which saved our championship. Y’alls friendship, skill and competitiveness made for a most memorable 4 days. You are the real National Champions of the 2018 MNC Texas Shootout! 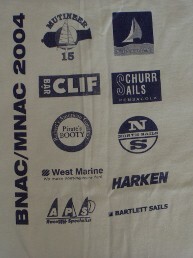 1pm - 6pm- On-site check-in, late registration, measure sails, inspect and weigh boats. 6pm - 7pm- Happy Hour (As is our tradition, those attending MNC will be asked to bring some of their favorite local beer to share with others). 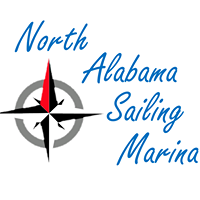 8am - 1pm- On-site check-in, late registration, measure sails, inspect and weigh boats. 2pm - 4pm- Practice races. 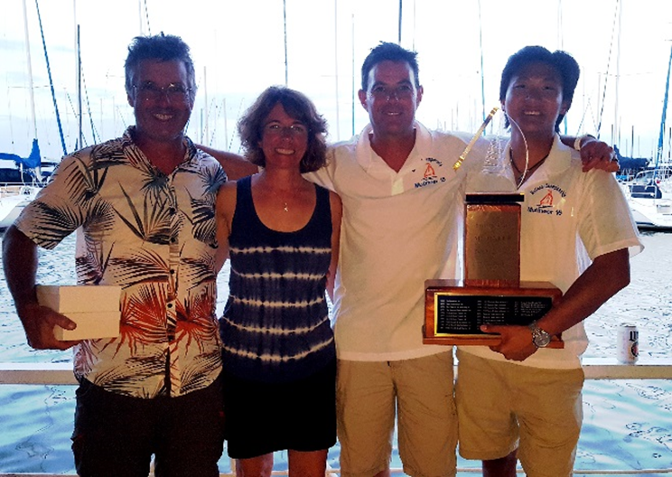 4:30pm - 6pm- Happy Hour..
6pm - Team/Skippers Meeting for Championship Regatta - Dinner on your own at Big Daddies. 10am - Warning signal for first race, additional races to immediately follow. 7pm - 9pm –”Cheeseburgers in Paradise” (Funded by the MCA). Free night on the town in Old Grapevine. 9am - Warning signal for first race, additional races to immediately follow..
4pm - 5pm- Happy Hour (As is our tradition, those attending MNC will be asked to bring some of their favorite local beer to share with others). 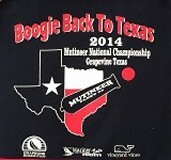 5pm - Awards Dinner – Texas BBQ dinner, followed by Trophy Presentations. (Location TBD).